This delightful little snack is something I used to make all the time when I first started WeightWatchers. It's a great way to extend an ordinary bagel into a long-lasting, filling and delicious bite. I was reminded of this yummy idea recently as my daughter has been really poorly with a nasty virus. She has only felt like nibbling on dry, plain foods, so I made some for her. When I researched the history of Melba Toast, I learned that it was invented in 1897 by chef Auguste Escoffier for Dame Nellie Melba when she was feeling under the weather too! I use WeightWatchers bagels as they are only 4pp/154kcal each. You can use whichever brand you prefer. Start by taking a whole bagel. I keep mine in the freezer and I find if just defrosted, it's much easier to cut them into very thin slices. Cut it in half to create 2 crescent moon shapes. Using a bread knife or sharp serrated knife, cut each half into thin slices. Cut as fine as you can (2-3mm wide). With practice, I can now get 6 slices out of each half! Arrange on baking parchment on a baking tray. Spray with Frylight oil or use 1pp/40kcal of olive oil from a spray container. This will produce a beautiful golden finish. Don't worry if you have any little odd or broken shapes-they're just as delicious! Bake for around 10-12 minutes at 200 degrees centigrade until a pale gold colour. Enjoy like this as a snack or with your favourite soup, dip or spread. I like them with extra light Philadelphia or reduced fat houmous. You could make a batch of these. Cool and wrap them in greaseproof paper in portions. Store in an airtight container where they will remain fresh for a few days. Pop a sugar lump in the corner of the container to absorb any moisture and keep them dry. Great for a Smash & Grab moment! Make croutons for soup or dipping in the same way, but by cutting small circular slices around the circumference of the bagel. Sprinkle with a little garlic salt or dried herbs. You'll make enough for 3-4 portions. Thanks for sharing this! What a great alternative to the costly chips. These will go perfectly with hummus, my favorite! Hot Off The Press! 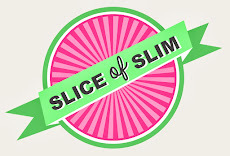 NEWS : Slice-Of-Slim Makeover!